What do artists need to consider when portraying trees? When I was a young boy growing up in the dry northern tropics of Australia I had trouble accepting that birds could actually live in the English trees that I saw in reproductions. After all, where I lived the trees had plenty of open spaces for birds to fly through and the foliage was so scraggy and thin that it offered little protection from either sun or rain. 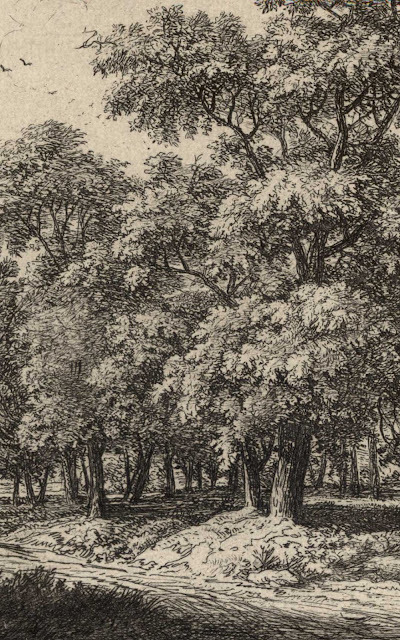 The reproductions of English landscape, on the other hand, showed trees that were so solid that a sculptor might well have moulded them in concrete. Mindful that there is a substantial difference in the attributes of trees in the tropics to those of trees in chilly England and Europe, this discussion is not focused on the tropical artists' approaches to rendering trees but rather on the conventions and issues facing artists in cooler regions where trees give shelter to birds. First I wish to address the Western lighting convention employed to depict foliage. This convention is simple: an artist lights the subject from the top-front-left because Westerners scan images from left-to-right following the direction they read. Of course for Hebrew and Arabic artists this convention is reversed because of their reading direction. And, if I may speak broadly, for ancient Oriental artists accustomed to reading text vertically, the convention had little meaning at all as can be seen in the virtual absence of side lighting but strong vertical lighting of their portrayed subjects. 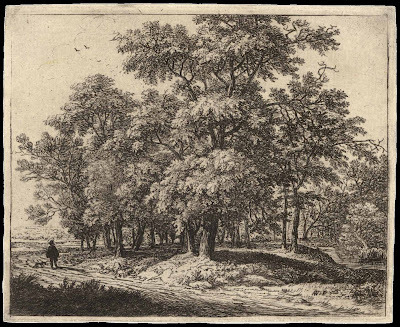 A fine example of the Western lighting convention is Anthonie Waterloo's etching, Traveller Near a Wood (shown below). Here the light catches on the foliage masses from the left as is appropriate for a left-to-right reading. The convention gives the foliage masses three-dimensional form. For instance, compare the same trees when the print is flipped as a mirror image (see further below) to see how the perception of form shifts to ambiguity in the reading of three-dimensions when the trees are lit from the right. This perception is the same as the “crater effect”: a perception that the moon has meteor craters when the light comes from the left and a perception of the moon having convex mounds when the light come from the right. 11.5 x 14.3 cm (plate) cut just outside the plate impression as was the custom at the time. Condition: a strong and beautiful impression on age-darkened paper with traces of earlier mounting on verso. 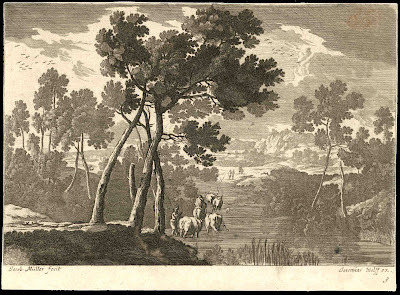 Plate signed on the lower right with the artist’s monogram, “AW.F” (Anthonie Waterloo Fecit [drew the print]). The print is in excellent condition with no stains, tears or other blemishes. I am selling this print for $156 AUD including postage and handling to anywhere in the world. Please contact me using the email link at the top of the page if you have any queries or click the“Buy Now” button below. 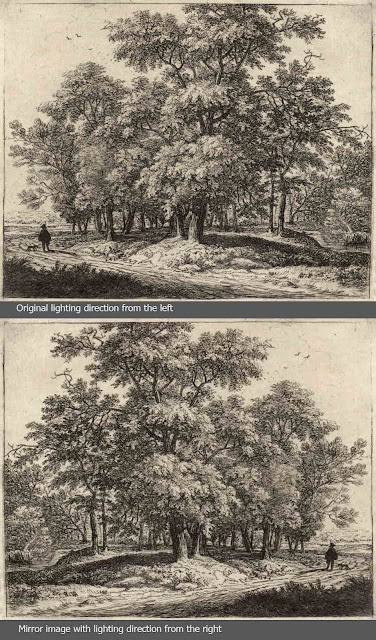 Another very important principle and one that is an extension of the Western lighting convention is the pictorial rule that the front face of foliage should be depicted in light tones while the more distant features should be shown in dark tones. 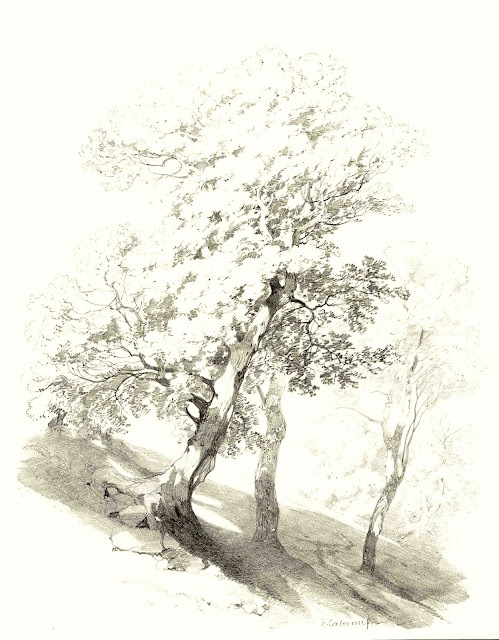 A superb draughtsman who exemplifies this approach is the Swiss artist, Alexandre Calame (1810–64) (see lithograph below). Few artists ignore this rule as it so well established that only the briefest look through the history of art shows that it has a very long pedigree. The concept behind this tonal transition is self-evident as a viewer can easily make out the details on the front of a tree whereas its inner depths are hidden in shadow. But there is a perceptual conundrum with this seemingly logical arrangement: the tonal transition from light to dark is in the reverse order to the tonal transition from a dark foreground receding to a light toned distance that is necessary to create the illusion of spatial depth. Condition: There are two closed tears that are virtually invisible (one tear is 1 cm towards the middle of the left side the other is 2 cm at the middle of the right side) otherwise in very good condition with no marks or foxing. I am selling this print for $136 AUD including postage and handling to anywhere in the world. Please contact me using the email link at the top of the page if you have any queries or click the “Buy Now” button below. Although there are very few artists who broke away from the principle that the front of a tree should be light in tone, a fascinating example of an image that presents a largely dark foreground plane of foliage is Jacob Muller’s, Landscape with Cattle Being Driven Through a River (shown below). Here a raking light of early morning or the setting sun’s final vestiges of light silhouettes the foliage masses. 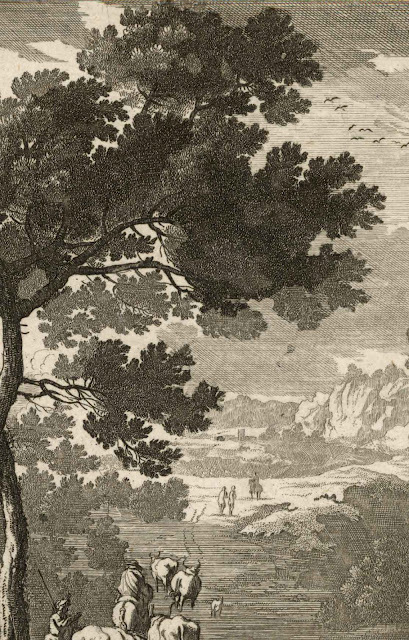 Interestingly, even though there is a clear tonal gradation from a dark foreground to a pale horizon, the silhouetted foliage is less than a convincing depiction. There is one missing ingredient that all great landscape artists take into account: the diminishing density of foliage from the centre of the foliage mass to the extremities of the final twigs. For photographers, this effect is known as the Sabatier Borderline effect. In short, what Muller has not portrayed in his landscape is the element of transparency amounting to a rim lighting effect to render the outlines of his silhouetted trees. Condition: Excellent impression on laid paper with watermark, trimmed along the platemark. There are faint red marks on the upper right but otherwise in a good clean condition. I am selling this print for $78 AUD including postage and handling to anywhere in the world. Please contact me using the email link at the top of the page if you have any queries or click the “Buy Now” button below.